Rest assured you are only getting excellent Horse Blankets for a less than wholesale price. 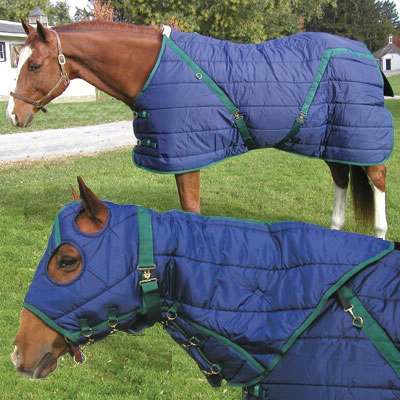 This is a weather resistant stable blanket that will protect your horse from many severe weather conditions. This quilted water resistant material provides a great blanket for all climates, as well as a great turnout blanket for mild climates. The blanket is composed of a durable 420 denier nylon shell, an internal 368g of fiber fill and a comfortable inner nylon satin lining. This beautiful horse blanket is accompanied by two adjustable straps at chest, as well as cross over surcingles and removable elastic leg straps. This High Spirit Snuggie Mini Stable Blanket is made of first-class nylon material and will last you several years even when used on a daily basis.